Erleben Sie Peking auf einer privaten Tour mit einem einheimischen Guide. Stellen Sie sicher, dass Sie alle Sehenswürdigkeiten und orientieren Sie sich an der Stadt. Genießen Sie den Hin- und Rücktransfer von Ihrer Unterkunft in einem privaten Fahrzeug. Entspannen Sie sich bei einem ganztägigen Ausflug, der die Vielfalt Pekings von Palästen und Tempeln bis hin zu Gärten und Märkten präsentiert. Passen Sie die Tour an Ihre Sehenswürdigkeiten an. Becky was our tour guide and she was fantastic. She coordinated a pick up at our hotel lobby with a clean luxury minivan for myself and 3 children, 8, 11 and 13. It was super hot but the driver had plenty of cool bottled water for our family and was prompt with pickups from the various locations. Becky worked with us to pack in a full day of touring without rushing us. In the morning, we saw the Temple of Heaven and Lama Temple. We had plenty of time to hear the history and visit the various buildings within both locations. Next Becky took us to a local dim sum restaurant. She assisted us in selecting from the menu and the food was fantastic. She helped the kids master the use of chop sticks and was patient with them but instructive. She also helped the kids understand the culture and history of China. She helped them with various Mandarin words that were helpful for the rest of the trip. After lunch I was amazed at how many things Becky was able to seamlessly coordinate. We rode in a rickshaw, saw a local Houtong home, listened to the Drum Tower performance next to the large drums and enjoyed a tea ceremony at the Bell Tower. I was amazed that she was able to coordinate everything and yet we never felt rushed. Becky was fantastic and if I could have scheduled her for our entire time in China I would have. She provided lots of great information for adults and the way down to the children. FANTASTIC!!! 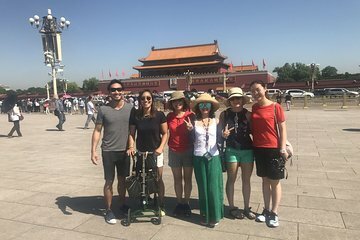 I booked this tour through Viator and during the booking I outlined all the things I hoped to see during my one full day in Beijing: Forbidden City, Tiananmen Square, Temple Of Heaven, some hutongs, and a great tea house. I requested a later-than-normal start time of 11:30, so I wasn't expecting to see everything on my list. But Susan and her driver made it happen and then some! Susan met me promptly at my hotel (Oakwood Residence Beijing) at 11:30. She was very friendly, enthusiastic, and spoke great English. We headed straight for Tiananmen Square and the Forbidden City. Susan was an absolute fountain of information at both of these places, and indeed everywhere we went that day. She filled me up with all sorts of interesting and historical things about everything we saw- things I would never have learned on my own or in a large group. And in so doing, she explained some fascinating aspects of Chinese culture in general. I often forget to take photos on my travels because I like to be in the moment, but Susan was right there to offer and suggest taking some great photos of me at all the places we stopped. She even suggested a jumping-in-the-air shot in front of the Temple Of Heaven, which was a big hit on my Facebook page :) I realized toward the end of the day that I had forgotten to include a lunch stop on my proposed itinerary. Once I realized I was pretty hungry, Susan happily brought me to a great local (non-touristy) dumpling spot where she told me all about authentic Chinese dumplings and even the right way to eat them, and she happily ordered for us. Again this was totally spontaneous and the fact that she was so prepared and happy to oblige was amazing. As we went parted ways in the evening, I felt as though I had seen and learned a ton and even made a new friend in Beijing, which is far more than I expected. I would gladly recommend Susan to anyone visiting the capital for any length of time.